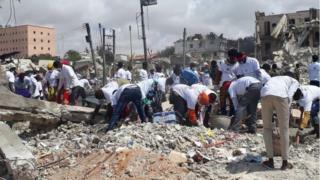 More than three days after two bomb blasts kill over 300 people for Mogadishu, tori be say some workers for Somalia emergency services don dey complain. Some of dem tell Reuters news agency say ambulance drivers no dey enough, and even di ambulance demself dey break down. Di medical people dem still say other problems dey like: na so-so checkpoint bin dey block di road wey dem wan use take enter hospital save people, and even blood no too dey for those wey injure. Na at least 400 people wound for di attack, and tori be say hundreds of people still dey find dia relatives for hospital and some dey even try enter di place where di bombs dem bin explode. Dr Abdikadir Abdirahman, wey dey run private ambulance service wey don dey respond to di attack, tell Reuters say: "we get old ambulances and after dem work for 24 hours for days, three come break down. Di telephones no get signal and we no get way to talk to each other." One ambulance driver wey be Mohamed Saiid say di security forces spoil dia work, and dem even fire gun on top dia vehicles. Im say e people dey shout inside public vehicle wey dey burn, but police open fire, and "when you wan save person wey wound, dey scream but one soldier use gun take block you...na tough work." Mohamed Howle, wey be another driver from one hospital for di city say police stop am from entering where di blast happen. "Dem stop me with gun as I dey small distance away from where bomb scatter." But Abdifatah Omar Halane, di talk-talk person for Mogadishu mayor say safety na di main thing to dey save people and delay no dey on top victim rescue matter. Police officer Mohamed Hussein tell Reuters say im don dey di area everyday since di attack, and nobodi fire on top any ambulance dem.